Modern style, great food and a ski-in, ski-out location – the Hotel Les Bruyères has it all. 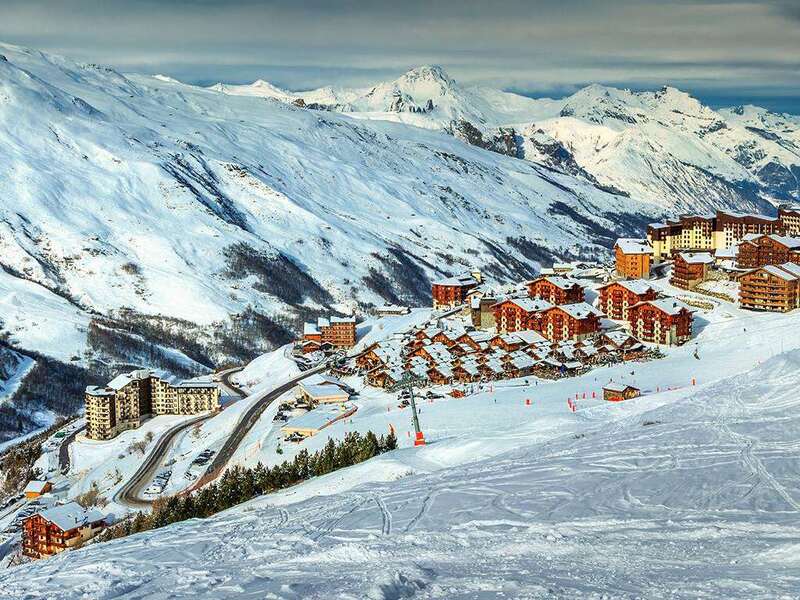 Close to the bottom of the slopes, the hotel has direct access to the lifts so you can be exploring the huge Three Valleys ski area in no time. It’s also really close to the resort’s Aquafun and wellness centre. The free resort shuttle bus stops outside the hotel and runs to and from the town centre throughout the day. Inside, the hotel is decorated in modern Savoyard style – think lots of warm wood and stone details, bright pops of colour and contemporary furniture. A highlight is the recently renovated L’Olympique bar, which has a stylish interior, a warming fireplace, and a large, south-facing terrace. The hotel is known for its good, traditional food, which is served in the Le Frontenac restaurant. Start the day with a varied breakfast buffet and end it with a dinner of local specialities, all enjoyed with a side of panoramic views of the mountains and valley. When you just want to relax, visit the wellness area and spend some time in the sauna and steam room, or even indulge in a massage or spa treatment. To burn excess energy, take advantage of the cardio machines in the small fitness area. After all that, you’ll be ready to retire to your room. Whether you go for a standard or superior room, it’ll be south-facing to make the most of the mountain sunshine, and will come with a flatscreen TV, safe and free WiFi. The orange and green tones make it a cool and comfy place to unwind. Standard (2 people): approx. 20m2. Southfacing double or twin rooms have flat-screen TV, balcony, minibar, safe, hairdryer, bath with overhead shower & wc. Superior Rooms (2-3 people): approx. 22m2 threebedded rooms are also available. Family Rooms: (2-4 people): Larger rooms with a double bed and a set of bunk beds suitable for children only. Interconnecting rooms available on request. Half Board. Buffet breakfast and three-course dinner. Christmas & New Year Gala dinners included. What a great hotel. From the minute we walked into the hotel all the staff were great and very friendly. The rooms are very smart and clean with a modern finish. The food is outstanding. The service we recieved put the icing on the cake for a wonderful skiing holiday.